Hong Kong ... the name itself conjures up images of intrigue, romance and history. All of these photos were taken in 1966. For those of you who now live, or who have lived, in HK, this gallery may be of interest to you. The 40+ years that have passed since I took these have also dimmed my memory as to what some of the subject matter is. If you can fill me in on the details, I'd appreciate it. Some of the photos are of The Tiger Balm Gardens which, sorry to say, are gone. Tiger Balm was an all purpose remedy and the company built and financed the Gardens which were located on the bluffs of Victoria Peak, overlooking the harbor and Kowloon. Please accept my apologies for the quality of the photos as slides tend to fade over time and scanning is an imprecise science. The Star ferry is about the only unchanged thing ! Great set of historical photos. Very nice pictures.. I was there in 1968 from Vietnam. Short respite.. My son and wife are going there and this helped me remember places we visited. We stayed at the president hotel. thank you. Tsim Tsa Tsui from 1963 to 1985. I have many old pics.Will send some soon. Tom how wonderful! I was in Hong Kong as a small child in 1951 and was taken by my grandmother and mother to Tiger Balm Gardens. The most wonderful place the memory of which has stayed with me my whole life. I have black and white pix from then, lovely to see the colored ones. The only big difference was I think the smell - in 1951 Hong Kong had a very peculiar smell - one that stuck in my mind for years. We were there on a private cruise on a freight liner that is how it was done in those days. My mother used to take oranges off the table and we would stand and throw them to the junk people. I can also remember my grandmother getting out of a taxi and throwing small coins around so that the children would run after them and not after us ....... the population was very very poor post WW2. Fantastic! Ap Lei Chau and Aberdeen was a backwater fishing village, until they built about 50 high rises there called South Horizons right before we moved there in 1992. Amazing changes and it still goes on. We were back in '08 and the Harbor keeps getting narrower and the tallest buildings keep getting replaced by ones that are taller! Great photos Tom and generated some great memories. Thank you. (I'm supposed to be researching facts for a piece I'm writing but got sidelined by your website)! 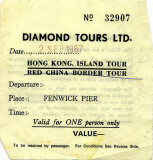 I travelled to HK on business several times from 1969 to 1980. Your pictures bring back many fond memories of HK and the people there, both residents and ex-pats. Great photos, Tom. Thanks for sharing. My wife and I were in Hong Kong in the summer of 1969, and I took a series of photos of similar subjects, color and B&W, which I am now preparing for a family keepsake book. Judging from the condition and quality of your photos, I presume you must not have used Agfachrome slide film - regretably I did for teh most part - they did not stand up well over the intervening 40+ years, as the Agfa dyes apparently had great appeal for mold. Wish I had used Kodak slides for the entire trip! By the way, I agree with your observation about Tiger Balm. I was there from 1952-1955 and from 1959-1961. Your park may have been part of the Botanical gardens which, if I remember correctly, was on your right as you went up the Peak road, past the Peak train Station which was on your left. The statue could have been of anyone in mythology or history. Tiger Balm Gardens had a lot of weird and wonderful folk law characters portrayed. Looking at Google Earth, I can't believe the changes that have been made. none of my previous places of residence are still in existence and Shatin and Fanling are unrecogniseable. Well done you for the photos, what great memories they stir up. I came across this as I was doing research while going through my father's pictures from 1945,we have some that are labeled & I know Tiger Pagoda was one place that I have alot of but there are other's that I am interested in finding out exactly where they were taken,it looks as if it could be a park & there is a statue type with a figure of a warrior maybe on a horse,any ideas? Thank you for sharing this travel in the past ! Don't know what to say to thank you for sharing such a priceless gallery! Going through it I have the same feeling of reading a great book - wishing it would not end! Thanks for your photos.I was there in 1968 R&R westpac cruise,wish I hadn't been so dumb and taken a lot of photos instead ofbar hopping. I can see what you mean about us probably standing on the exact same spots. Seems like we were following each other around the world. Splendid album, brought back many memories. Must unlock the comment box in my galleries so others can join the fun..
tHESE PICTURES BROUGHT BACK A LOT OF MEMORIES ...WE LIVED IN HONG KONG 1968-1969. i CAN REMEMBER THE WATER TAXI'S THE HILTON HOTEL, VICTORIA PEAK THE TIGER BALM GARDENS.. WOW THANK YOU FOR THE PHOTO'S. i DO NOT HAVE ANY AS MY PARENTS HAD ALL THE PICTURES AND THEY HAVE LONG SINCE PASSED AND NO ONE COULD FIND ALL THE PICTURES. Thanks for sharing this beautiful Hong Kong tour. V.
There were tangible testimony of the Hong Kong history! It's my pleasue to share the precious and valuable pictures! I wrote some kind of the feeling about the history, but I think of I lost it when I did click it! It seems the description I wrote had disappeared when I click it. Have you received it? Great Gallery! Wonderful history lesson for some of us! Looks like you had a great time there! Thanks Tom, for taking the time to do this and for sharing it! Fantastic gallery Tom. I know the often painstaking work this kind of project can take. It's great to read all the comments from people with memories of Hong Kong, then and now. Small world (to coin a phrase)! Tom , again thanks for posting things I saved over the years. I enjoy the pictures every time I see them. Takes me back to when I was there in 66-67. You took some very clear pictures. Keep in touch. Bravo Tom pour ce travail historique. Looking at those pictures, it rekindled memories of my adolescent years in Hong Kong then. The one about Nathan Road with festive holidays ornaments and decorative lightings really reflected its status as one of the foremost westernized city in Southeast Asia. Even in those days, the view of the Victoria Harbor enchanted many visitors, primarily well heeled Americans. My parents owned fashion boutiques both in Peninsula Hotel, next to Star Ferry and Hilton Hotel in Central District. American & European tourists, rather than mainlan Chinese these days, were our customers. A trip to the peak for the harbor view in the evening, followed by dinner at the floating restaurant were the two must do items. Tagging along, I ate plenty of exquisitely prepared exotic seafood dishes there too. Great photos! To the author and all lovers of good old Hong Kong, the"A Mystery ..." photo is the name plate (which reads çè­) that exists at the extrance to the villa in the "A Modern (1966) Villa" photo. The villa is located at 99 Repulse Bay Road. It is a Victorian-style mansion. It still exists. Thank You, Tom for your wonderful Images of Hong Kong And Kowloon. They bring me back there to 1966. Marcos Lim at Elk Grove, CA. U.S.A. Thank You For All Your Wonderful Images And Bring back my memory of Hong Kong And Kowllon back to 1966. Thanks for the wonderful pictures of Hong Kong in 1966. I went to school there from 1966-1967. Repulse Bay and Shek O Beach were the best! What happened to the original President Hotel on Kowloon? I stayed there often back in the late 60's. Like a time machine, bring me back to 1966. Thanks very very much! Good job! Frank L. Great pics, I was there in 1962, and have many shots of the Tiger Gardens also, brought back many good memories. Surely all in 1966 ?? I am born in this year.....so great!! I will show these photos to my dad and mum. WOW!what a find.I was in Hong Kong 4 times between 1966_68.Especially liked the Tai Pak Restaurant.Was on the USS DALE DLG. These are fabulous, and bring back so many memories. I moved to HK in 1967, and lived in Repulse Bay in the twin towers in one of your shots here, and beneath the Peak in mid-levels above Central with an amazing view of the harbour. Lived in HK from 67-72, then spent summers there through 78. Member of the HKIS Alumni Association, and sadly much has changed in HK, especially the loss of many historic buildings. The old Repulse Bay Hotel has been rebuilt, too bad the original was lost, and the Hilton downtown is another loss. THANKS for these memories. Very nice photos of Hong Kong, I was there twice in 1966 and 1967. I stayed on the Kowloon side and had a great time, of course I was horny as all heck and spent some time with Champange( my rented lady) in my room. I took of couple of tours also on the Hong Kong side and was amazed at the hill of refugees I saw. Often wonder how things look today, over 40 years later. Lovely set of pictures Tom. I was in HK with the Royal Air Force in the early 70's and your photographs remind me of those wonderful days. Little had changed then from your time in the mid 60's. I have been back several times in the last few years and it is no longer the "mysterious orient" that it once was. I spent numerous weekends in Hong Kong and Kowloon during the 1963-1965 time frame and have not been back since. Your pictures brought back many memories including staying at the President Hotel when it was brand new. I believe the lounge there was called the Firecracker Lounge. Aberdeen is my birthplace in HK. My father was a cook chef of Tai Pak Floating Restaurant between 1950s and 1973 before we immigrant to USA. The long gone Tiger Balm Garden was my lunch stop next to my school-Kung Lee College established in 1971. My dimmed memory brighten up by your pictures. Hi, Tom, thank you because your photo let me know more about my home, Your photos also are really nice! It is absolutely wonderful that you can share these photos! Having spent some time growing up in HK in the '80s, it is very interesting to see these images from the '60s. Especially when you compare them to the present. I have never been to HK, only Shanghai in China, but this is definately an interesting gallery. Very nice gallery , you visit is well covered. I love returning to your historical galleries, especially to find new gems. Well done Tom, keep up the great work! We moved to HK when I was 8, in 1969, and I'd been looking for pictures to remind me of what it was like then. Thank you SO much for posting these!! Thy brought back awesome memories!! It is amazing to see how this city has changed over the years. Great gallery! Tom, Nice to see your photos. '66 was a great time to visit HKG. Did you do a shot of the old Repulse Bay Hotel? A touch of nostalgia has just swept over me. Tks for the memories. Kim D.
What a neat gallery. I have never visited hong kong but I know a lot has changed. I am looking forward to having a chance to go there, hopefully in the next couple of years. these are truly historical, such "flat" landscapes from the peak~ thanks for sharing! lovely place to visit and thanks for sharing your happy moment in HongKong. Great gallery Tom, thanks for sharing it and great job for recorded the city, it has changed so much since then. I just visited the Tiger Balm Garden area few days ago, only a small house of Tiger Balm left, the other part has become a luxury building which costs about HKD10,000-30,000/sq ft!!! thanks Tom, these are wonderful shots of old HK. I came to HK in the mid 70s, and your images certainly aroused my fond memories. These are very precious records of old HK!! the pictures are surprisingly clear. Ironically, the colours of old HK seems to be much richer than the colours seen in nowdays, blue sky and water... how often do we see it in now days? Thanks for sharing. An invaluable collection of photos for those of us in Hong Kong who were still young in 1966. Another historically fascinating gallery, Tom. Thanks for posting these Tom. My favorite stop on that government sponsored tour of S.E. Asia so long ago and so yesterday in my memory. Wonderful gallery! I really enjoyed the photographs of HK in the 1960s' !! BIG V O T E ! ! ! dear tom, u've done the amazing job! Hong Kong is my hometown, and it's my pleasure to see those photos which took in 1966! Most of the places changed a lot here, especially Victoria Harbour, lucky, star ferry still like the same! This is a wonderful gallery Tom. Did you scan the slides yourself or have them done by someone? It was on December 2006 when I first saw this Gallery. Really appreciate your recent uploads to this meaningful gallery. Thanks a lot for adding new photos. A nice, interesting gallery, Tom. A few scenes look kind of surreal. Well done. Nice gallery Tom, I am doing my last Hong Kong trip on the 5th of May, hope to get some good shots. I love to look at your photographs from the earlier days. It is really amazing how things have changed!